Loki passed away yesterday, around 3 pm, at home in my arms. When I woke up in the morning, his body was pretty limp and I don't think he could move around. He ate some peas that I skinned for him, but he didn't have much energy. I could tell the end was near. I put on a sweatshirt with one of those center pouch pockets and put Loki in the pocket and kept him with me all day. I wanted to be with him when he left us, so he would know he wasn't alone. He did not seem to be in any pain - he just had no ability to move about. I gave him some water from a syringe so he wouldn't be dehydrated, and kept him warm and cozy in my lap all day. He seemed to pass away peacefully, and I am glad he went this way. I am so relieved I didn't have to bring him in to be put to sleep at the scary vet's office where I couldn't be with him when he passed. Loki, we will miss you greatly. 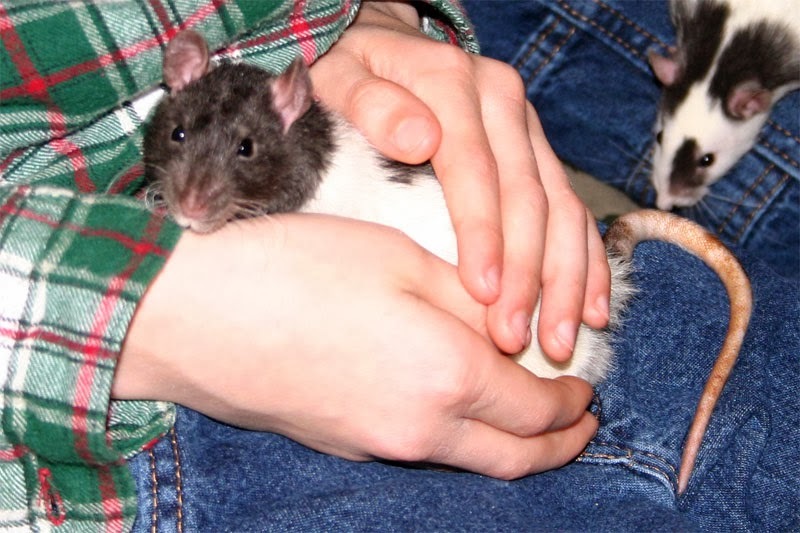 Farewell, my grumpy old man rat who turned out to have a heart of gold. Play hard over the bridge and be nice to Pirate. On Sunday night, we took Loki out for some cuddle time (he is not so active anymore for play time) and he was in bad shape. He was lying on his side and he had completely lost control of his rear legs and tail. His lower half was completely useless to him. I thought the end must be near and I let him snuggle close with me while we watched Downton Abbey and Sherlock on PBS. I tried to get him to eat something but he would have none of it - not even a lick of yogurt. Eventually, I had to put him back in his cage, because I was on the verge of falling asleep and didn't want to drop him or roll over on him. I put him back on the upper level of his cage, where he prefers to sleep, with easy access to food and water - lowering the water bottle so he could reach it without standing up. That was a mistake. I went to get him his meds and while I was gone, my son saw him fall down to the lower level. So I moved everything down to the lower level where he couldn't fall. I was sure he was going to pass away during the night. He didn't seem to be in pain, but he was so lifeless, I didn't have much hope. If he was still with us in the morning, I planned to take him in to the vet to be put to sleep. To my surprise, in the morning, he had managed to get inside his wooden chinchilla hut (an impressive feat, since the opening is a small circle that is raised a bit above the floor). He was sitting upright with his eyes wide open and bright, completely alert and aware. I was quite surprised and left to make him some veggies and oatmeal for breakfast. He hasn't eaten veggies for several days, but I still bring them anyway. When I returned, he had managed to leave the hut and climb back up to the upper level. He regained motion in his legs and tail, although he is terribly uncoordinated. I offered him the breakfast, and to my surprise, he ate some corn and peas, for the first time in days. He struggles to hold his food, as is typical with pituitary tumors, but he is managing. It is our belief that he suffered a stroke last night from which he has recovered pretty well. So we have been granted a short reprieve and we will make the most of these final days. Loki had been deteriorating rapidly in the past two days. Two days ago, he would only eat a little baby food and some oatmeal. Yesterday, we couldn't get him to eat anything until the afternoon, when he took some yogurt. He was bruxing a lot and I was pretty sure it was not the happy kind. He saw our vet later in the afternoon and she confirmed my belief that he likely has a pituitary tumor (PT). We have two options. We could try steroids to make him more comfortable and relieve the symptoms as he lives out his remaining days. Or we could try one of the drugs that might give him a few extra months - bromocriptine or cabergoline. Those drugs may help or may not and they could also bring with them unpleasant side effects. As much as I would like to try one of those drugs and see for myself if they have any positive effect on the pituitary tumor, I don't think that Loki is the right candidate for that. If he were younger and healthier, I would be willing to give it a go. He has had so many health problems in the last year and he now has surpassed the two year mark and I just don't want him to struggle with anything else. I don't want to extend his life only to be miserable or to have one of his other health problems come back or have something new take hold. I don't want to turn his last months into a battle. I want to give him some peace and comfort and when that is no longer happening, I want to help him cross the bridge. So I opted just for the steroids. When our rat Weasel developed PT in late 2012, it hit him suddenly and severely. He had a lot of ups and downs. His ups (while on steroids) were pretty good, with him being aware of us and being able to hold food a little and eat. His downs were frightening. His eyes were glassed over and I don't think he was aware of us or his surroundings. He would move in bursts in a type of crawl run with no sense of direction, suddenly bursting forward regardless of what was in front of him. He would run right into a wall or right off a ledge without hesitation. Then turn, pause, and burst forward again. Run, crash, repeat. Once I found him with his front half run up the cage wall and his back half on the floor, his teeth clenching the cage bars as if he were stuck and hanging there. I freed him and he acted unaware. These terrible spells were short lived, though, and then he would regain himself. I was too focused on trying to treat him and those good periods made it too tempting to keep trying to help him. But I should have let him go, because the night he passed was a really bad one, and I would have had him PTS if he hadn't passed before morning. We found him lying stretched out in his litter box, where he had loved to sleep in happier times. It broke my heart, but I was so glad it was over for him and so sorry I didn't help him avoid that misery. I won't let that happen to Loki. I am sorry I was not experienced enough to spare Weasel that suffering. At the first sign that Loki is unaware of his surroundings or having fits of movement that he cant control, or some other symptom that is equally as bad, I am going to take him to the vet to help him over the bridge. Fortunately, Loki's symptoms have developed more slowly than Weasel's, and Loki so far has always been aware and in control. We started the steroids yesterday and he now has had two doses and he has eaten better today than he did yesterday, so perhaps they are starting to have an effect. Hopefully, we will see some improvement in his balance and coordination soon. He probably doesn't have more than a month, but maybe he will surprise us. Whatever time is left, I am going to make sure it is in peace and comfort. ﻿I mentioned earlier that Loki is having balance problems. He tends to roll a little to one side, especially his rear end, when he tries to move about. He is slower and has become more cautious about moving. He can grasp food okay so far, but only does so with one hand, saving his other for keeping him balanced. He seems uncoordinated. using the other for balance. I was kind of hoping to be able to attribute it to hind-end degeneration (HED), but his rear legs seem to function fine, it is more of a balance/coordination issue. So that points to a neurological cause. Those symptoms are starting to worsen. I am afraid he may be dealing with the early stages of a pituitary tumor. This is the worst diagnosis a rat could possibly have (of those things that I have experienced so far, anyway). 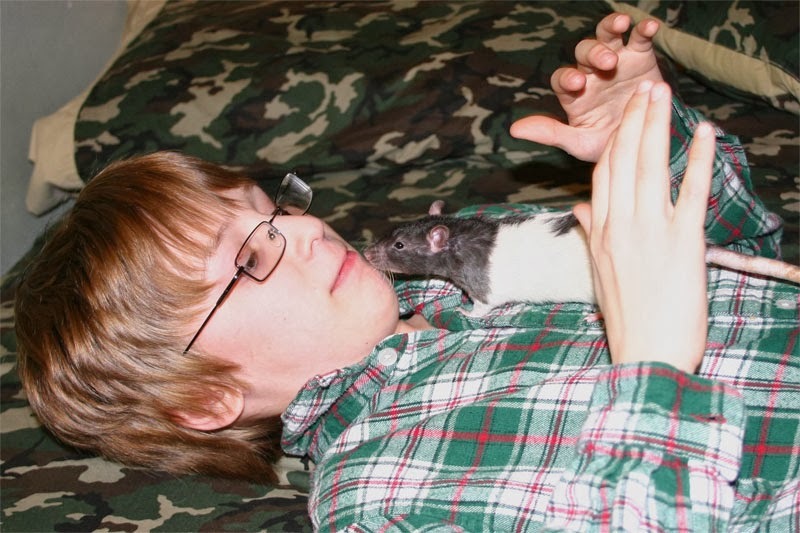 Our sweet Weasel (unrelated to Loki) passed away from a pituitary tumor in late 2012 and it was the worst way to go. A pituitary tumor is pretty much a death sentence. A steroid like Prednisone may help relieve the symptoms, but will not treat the condition. Weasel was on this med and it did give us a few good moments before his passing, but they didn't last long. I have heard that there are two other drugs that may give you more time - a few more months. Sometimes they work, sometimes they don't. They are cabergoline and bromocriptine. Cabergoline is a more well-known treatment, but it is very expensive. And like I said, it won't cure your rat, it will only buy you some time. Maybe. Bromocriptine is less well-known. However, it is cheaper than cabergoline and only slightly less effective. Weasel never had a chance to try these drugs - his symptoms came on quickly and while the vet prescribed the prednisone for me over the phone, Weasel didn't make it to his appointment where we were going to discuss other medication options. Loki has a vet appointment scheduled for Wednesday. If she concurs with my assessment, I plan to discuss these options with her to see if either will be right for him. Loki's symptoms have started more slowly than Weasel's (or maybe I just am better at recognizing early signs now), so maybe there is a chance the medication can help him out for a while. On the other hand, I don't really want Loki to go through the bad periods that Weasel went through. I don't want to extend his life only to extend his suffering. At the first signs of those terrible symptoms, I would prefer to help him over the bridge. You may recall video from a study that made the news a short time ago, showing that rats can experience empathy and will work to free a trapped rat even if there is no reward in it for the free rat. This should come as no surprise to anyone who has owned rats, but it is nice to have documented evidence in a legitimate scientific study. 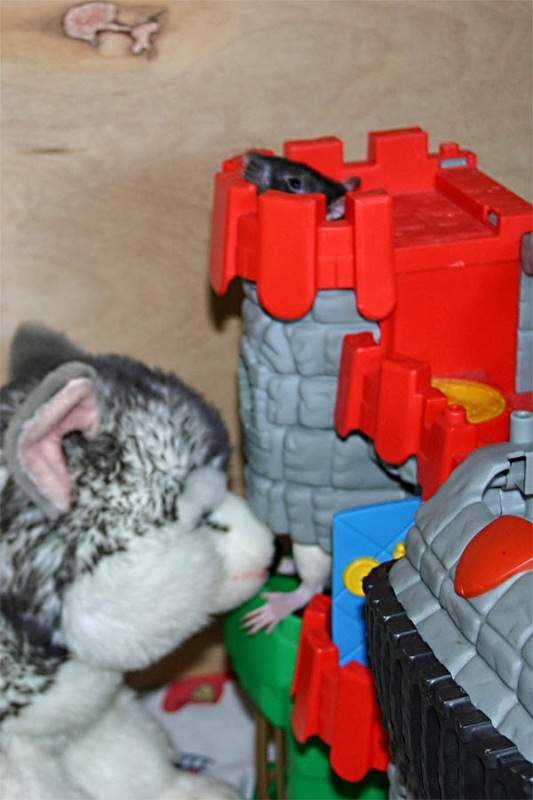 Further investigation has been done on this empathetic behavior, and scientists have shown that rats use their experience with other rats to motivate them to free the trapped rat, and not some instinct that recognizes his/her own kind. In the previous study, the rats would release stranger rats of their own kind (PEW, or albino as the study referred to them). In this new study, scientists documented that rats from an albino strain did not release rats from a black-hooded strain. But, if the rats had been introduced to a black hooded rat previously, they would release a black-hooded rat from the trap, even if they did not know the rat they were releasing. On the other hand, if a rat from an albino strain was fostered to a rat from a hooded strain and had no prior contact with any rats from his own albino strain, that rat would not release albino rats from the trap. Here is a fun trick I have been working on for dressing up certain types of hammocks: adding a fleece border to the open edges. This works extremely well for pocket hammocks, tunnel pockets, tubes, and double deckers. Not only does it look nice, but it cuts down slightly on the amount of cotton print that you will need, which sometimes comes in handy if you are just a little short. You do need a little extra fleece, but since fleece comes on a wider bolt than cotton, I usually have more fleece than cotton for any given hammock set. 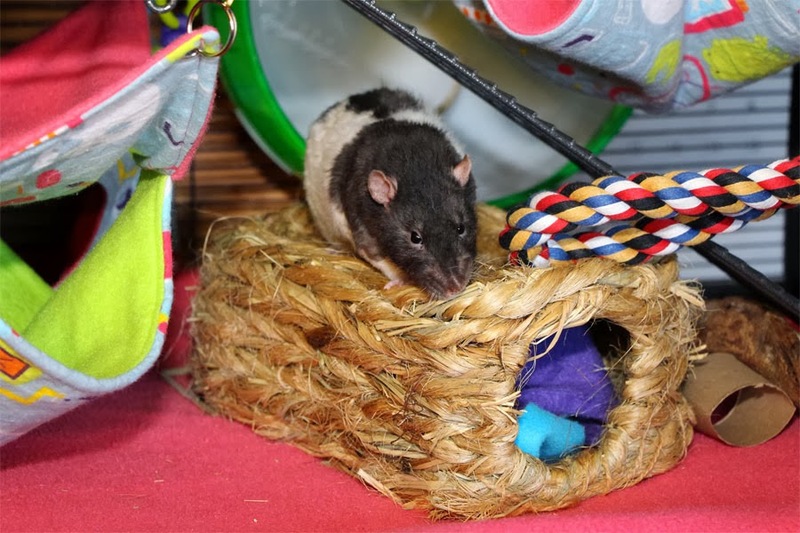 It is really quite simple to modify some of the tutorials in our Tutorials for Common Rat Hammocks and Accessories to create this effect. First, you must decide how wide you want the border to be. I have experimented a bit and I like 1.5 inches per edge, and will use that measurement for the following tutorial. As an example, I will illustrate how to modify the pocket hammock so that the opening of the pocket has a 1.5" fleece border on both sides. The pocket flat calls for one piece of cotton and one piece of fleece to be cut in a 15" x 33" rectangle. 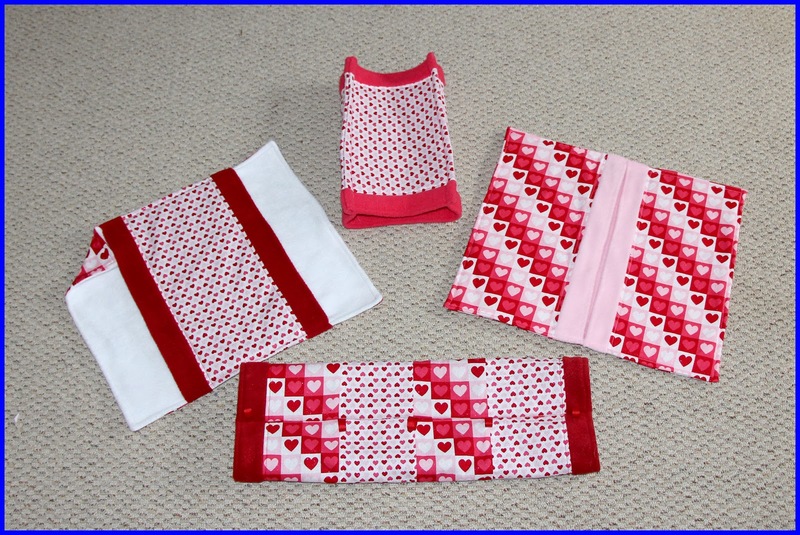 Because we want a fleece border of 1.5" on each end, our cotton piece can be cut 3" shorter (1.5" x 2 edges = 3" shorter). This means we cut the cotton piece 15" x 30". Since we lost 3" of our cotton, we need to get that length back from the fleece. 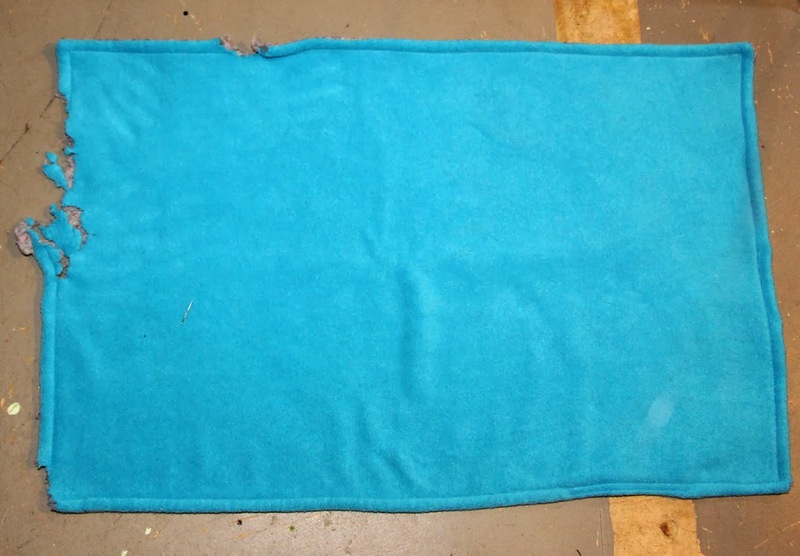 So we increase the fleece length in the tutorial by 3", to make a 15" x 36" rectangle. Note that the fleece piece will be 6" longer than the cotton piece. Once the fabric is cut to size, the tutorial calls for pinning the cotton to the fleece, right sides together, along the two short ends only. Because we are now working with fabric pieces of different lengths, I recommend doing this one end at a time. So, line up the cotton and the fleece, right sides together, along one of the 15" sides. 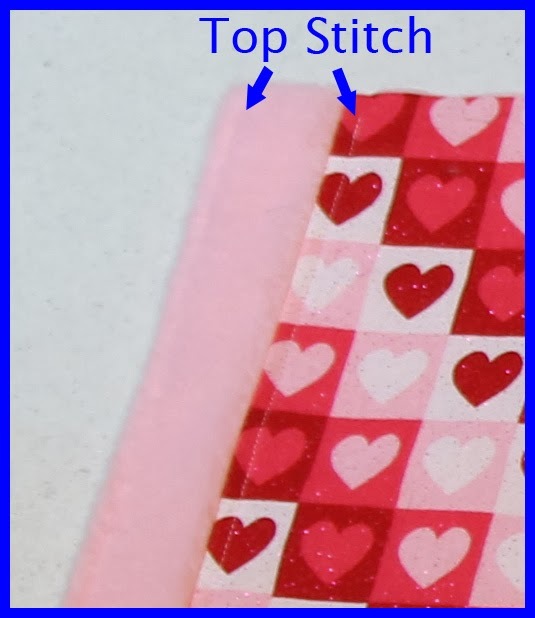 Pin the edge and sew, trimming the seam allowance and the excess thread. Now, reposition the fabric pieces so that the other 15" edge is lined up. Pin that edge, and sew. Trim the seam allowance and the excess thread. Once both ends have been sewn together, turn the fabric right side out. Adjust the edges until each end has the same size fleece border (1.5" in this case). Pin the fold to hold the fold in place and top stitch along the edge of the fleece on both sides. I also top stitch along the cotton edge near the seam attaching it to the fleece. 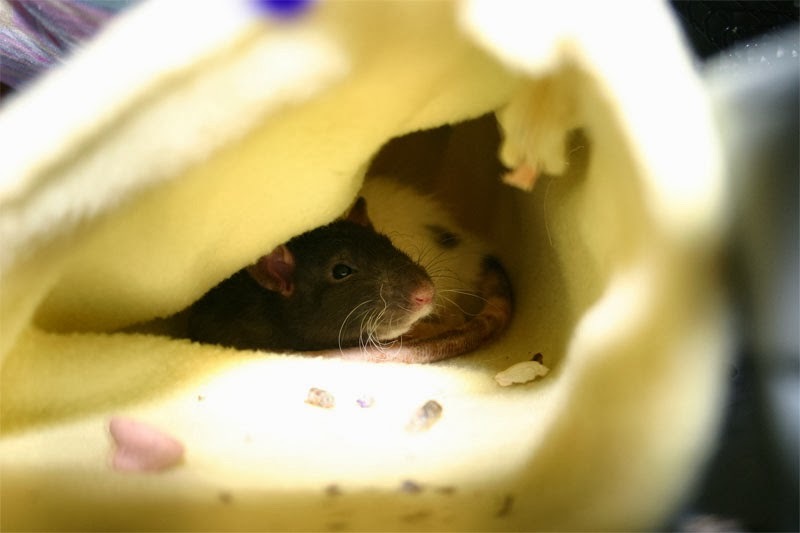 You can also modify the tunnel pocket so that the "blanket" on top of the hammock has fleece borders. 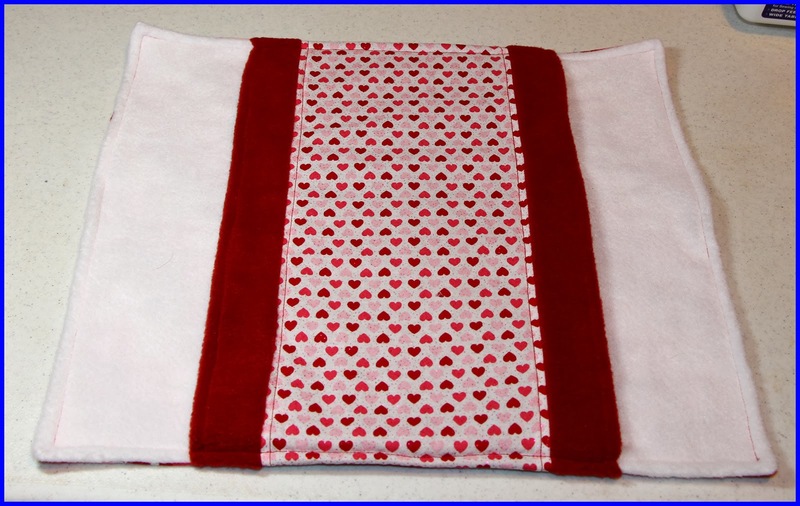 To do this, instead of cutting the blanket piece to 15" x 10", you should cut it 15" x 7" (assuming a 1.5" border). 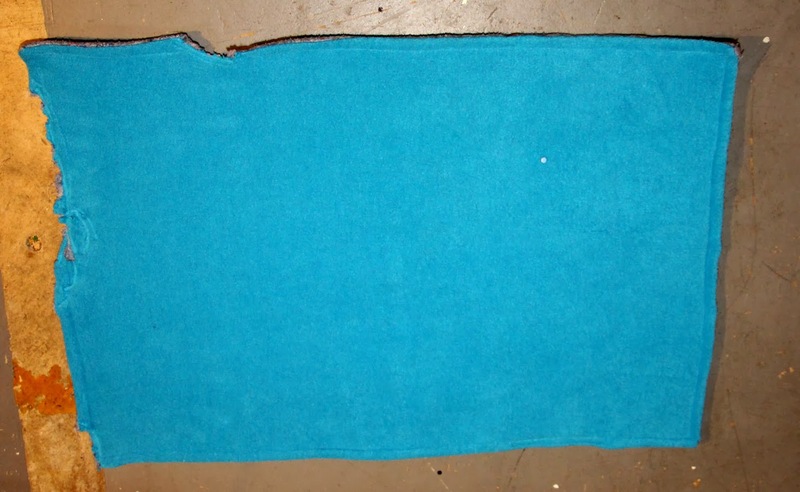 You should cut the fleece piece to 15" x 13" (again, 6" longer than the cotton piece). Sew the 15"-long edges of the blanket, cotton to fleece, in the same manner as described above for the pocket hammock. To highlight the fleece border, I like to use a different color fleece than the fleece used on the bottom piece. 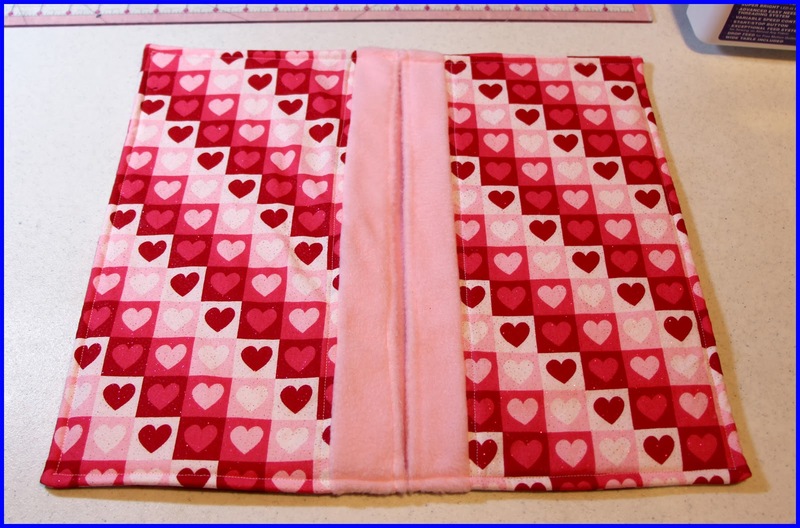 Likewise, the double decker can be modified as follows (for a 1.5" border at each opening): Instead of cutting the cotton piece to 13" x 20", cut it 10" x 20". The fleece should be cut 16" x 20". The 20" edges should be sewn together in the same manner as for the pocket hammock. Finally, the tube can also be created with a fleece border. If using the dimensions provided in the tutorial, instead of cutting the cotton piece to 16" x 19", cut it 16" x 16" (for a 1.5" border). (This makes an 18" tube. If you are making a tube of a different length, cut the cotton length 3" shorter than you normally would cut it.) Cut the fleece piece to 16" x 22" (or 6" longer than you cut the cotton piece). Sew the fleece and cotton together along the 16" sides (where the tube opening will be) in the same manner as described above. I really like the way that this technique will bring out the fleece color in some hammock styles where you wouldn't normally see much of the fleece, such as the pocket hammock. I find this effect to be more visually pleasing and it gives the hammock a warm snuggly appeal. 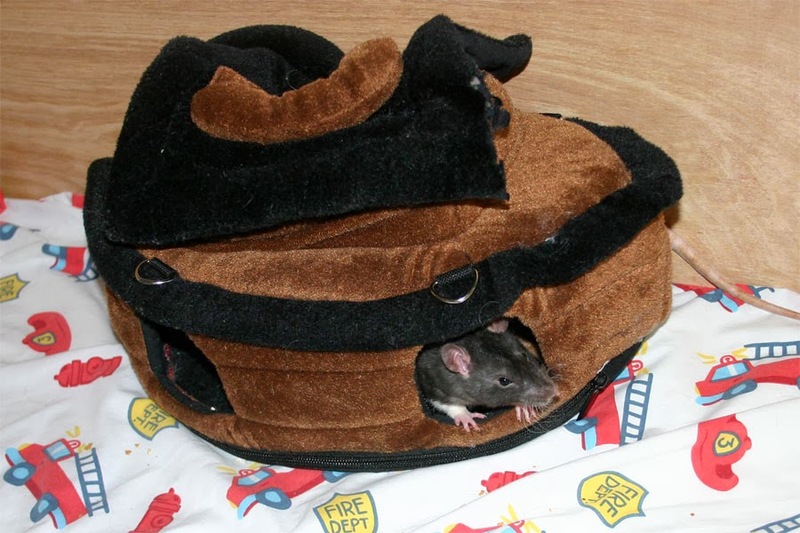 I am working on adding the instructions for this technique to the Tutorials for Common Rat Hammocks and Accessories, along with adding instructions for a corner hut (like a cube, but made for hanging in cage corners) and instructions for the U-Haul furniture pad liners as described in a previous blog post. I will post when the updated document is available. Smokin' Loki has reached the age of two today! We celebrated this morning with a little scrambled egg in addition to his veggie breakfast. I am sure the day will bring him lots of treats. We were not at all sure he would make it this far. We lost his brother, Pirate, several months ago to a tumor in his lung. Loki, himself, has been plagued this year with respiratory infections, skin infections, abscesses, and most recently, a urinary tract infection which was successfully treated with Trimethoprim Sulfa. Today, however, he seems mostly healthy. His respiratory symptoms are minimal (he has damage from previous infections and is on Doxy for life to prevent infection of those damaged areas). His skin is better than it has been (the meds for the urinary tract infection actually helped with the skin issues, so there may have been some residual skin infection left behind). He has, however, been showing signs of a slight balance issue. He is slower and more clumsy than usual. He can grasp food but only does so with one hand (as shown above). The symptoms are extremely mild, however, and hard to notice unless you spend a lot of time with him. I suspect something neurological and am trying to get examples of the problem on video before I bring him back to the vet. At any rate, we are glad to see him with us at the age of two and we hope he continues to fight his little battles and stick it out. 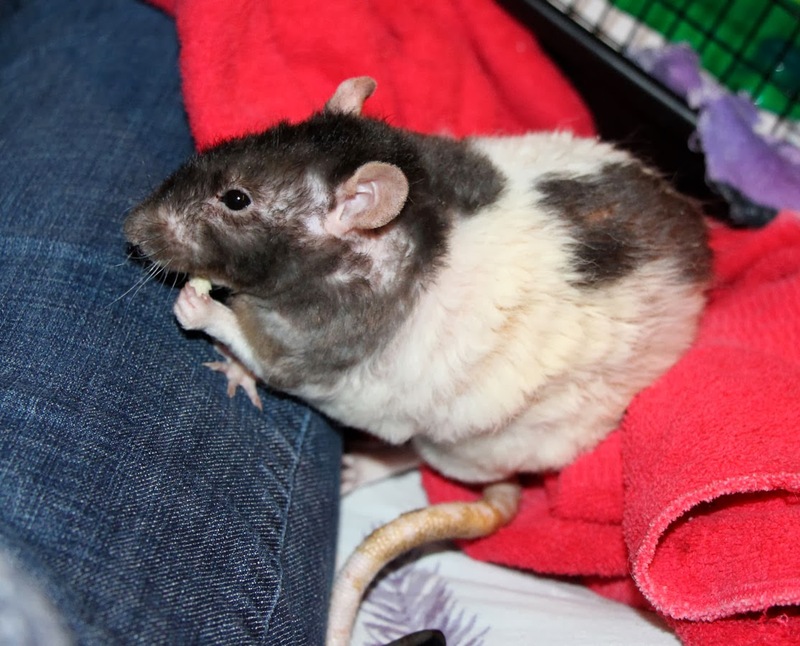 He can be something of a grumpy old man rat much of the time, but he has also turned into a cuddly snuggly licker when he feels like it. 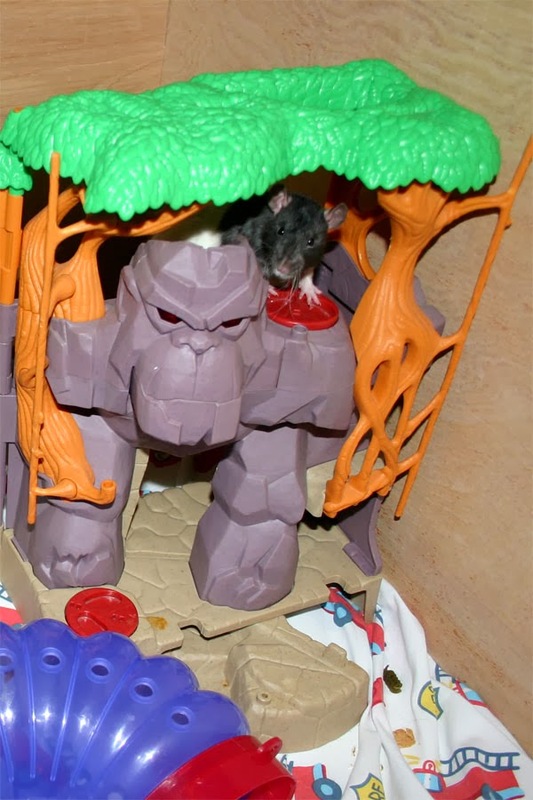 He has taken a little more understanding than the other rats we have owned, but deep down, there is a sweetie in there, just a little afraid to come out. We've been using Liners made from Fleece and U-Haul Furniture Pad Liners since October and we are still very happy with them. They control odor very well for our small group of rats. Three girls in a DCN can go a week without a thorough cage clean - and have gone a little longer at times when I haven't been able to get to it as promptly. 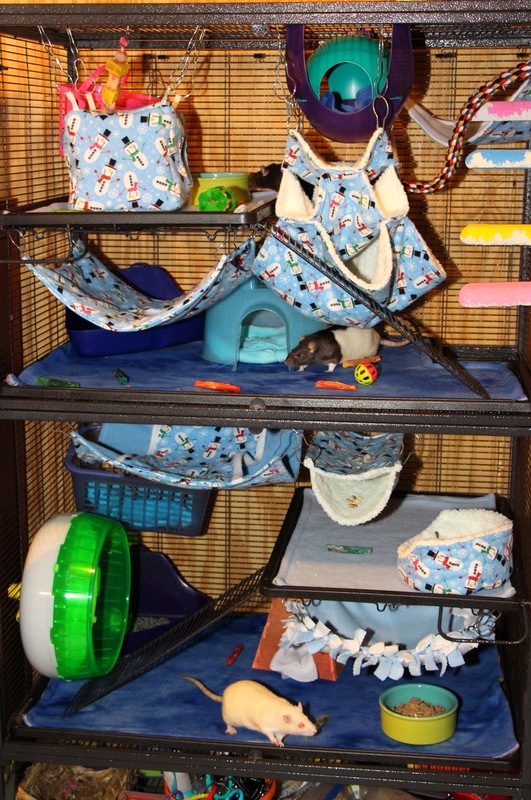 They hold up much better for us than using pillow-case style fleece liners with towels underneath, as this group of rats loved to chew holes in the fleece to get to the towels and then shred the towels down to strings. 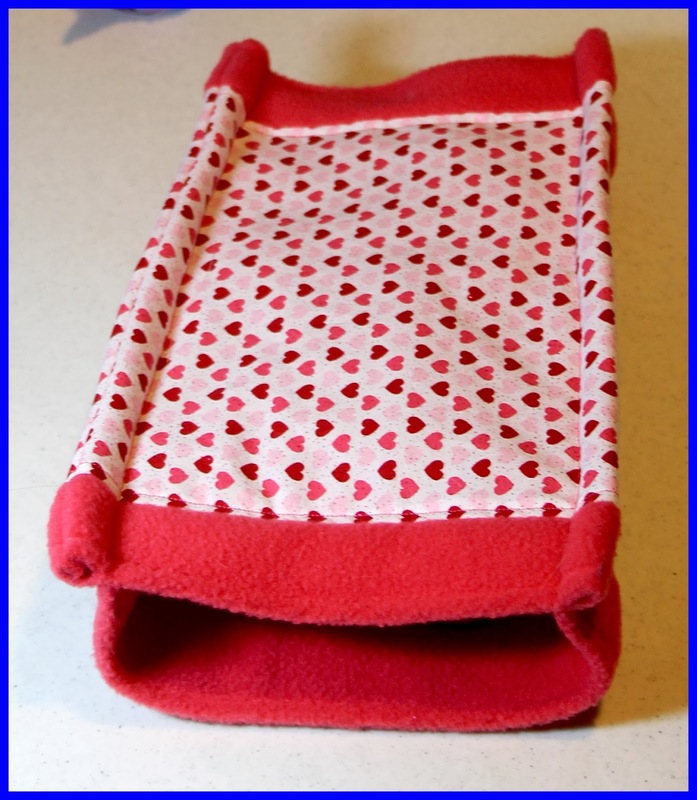 It was very hard for me to repair some of the damage they did to the fleece and the towels were shredded to beyond usability and were becoming dangerous because of the presence of loose strings. That said, it would be unreasonable to expect chewers to leave their liners perfectly intact. I went in expecting chewing, but hoping for less damage and damage that was repairable. So far, I have been pleased with the results. Many liners get through the week without being chewed. It is not uncommon for some liners to suffer some nibbling on the edges. Most of the time, this damage is minimal and often doesn't even require repair. I have one bottom liner that suffered significant chewing along the leftmost edge. (The damage to the top edge of the liner and to the bottom left corner are more typical of the usual damage I might expect. This kind of chewing is unusual - although it may become more common now that they have begun. 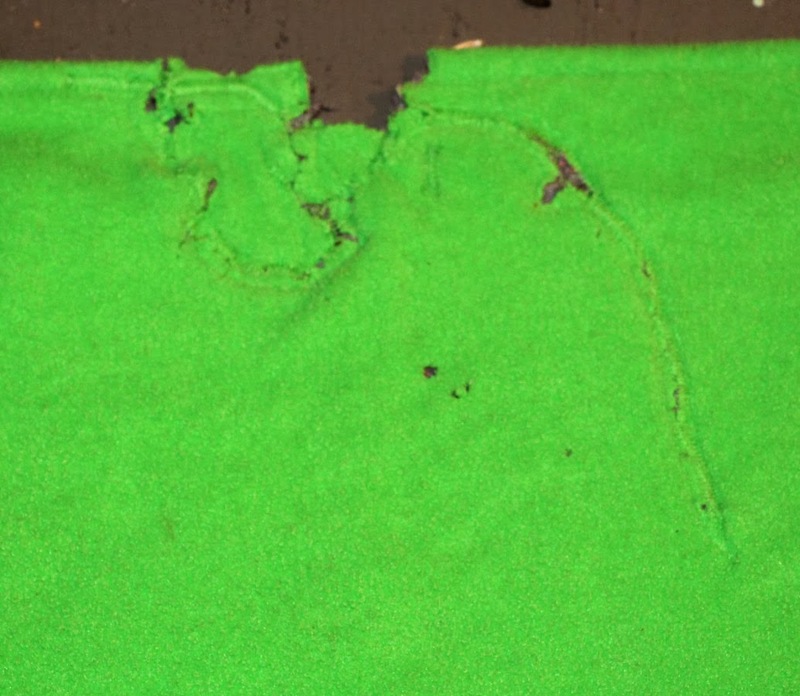 This liner was easily repaired by first topstitching around the chewed area to contain the damage, then using a zigzag stitch to reaffix the fleece and furniture pad. It is possible that this damage was encouraged by the use of a binder clip to secure the liner in place. I am currently trying to place the liners without securing them with binder clips, to see if this makes a difference in the chewing. It is possible that if they are free to pull on the edges of the liners, they won't do as much damage. It is also possible that if they can pull the liners to their desired location, they will then sit there and do more chewing. Only time will tell. 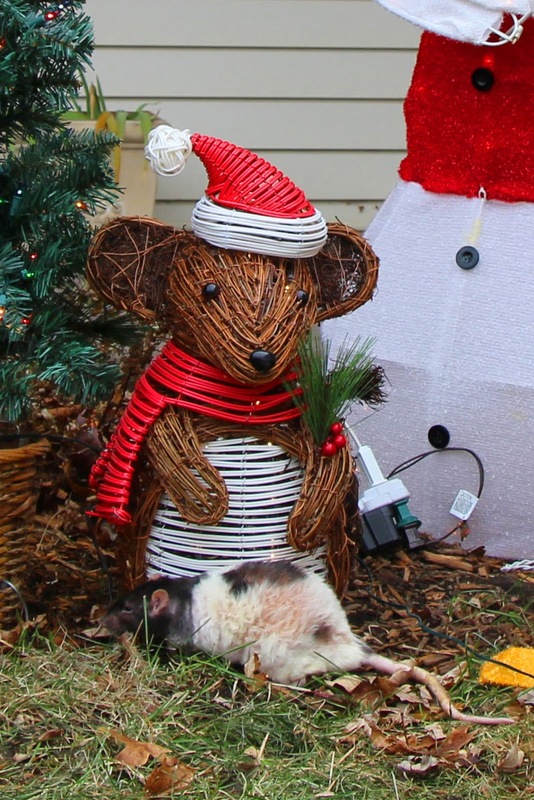 About a month ago, the rats also decided to chew the top liner used in one of my Christmas-themed designs. 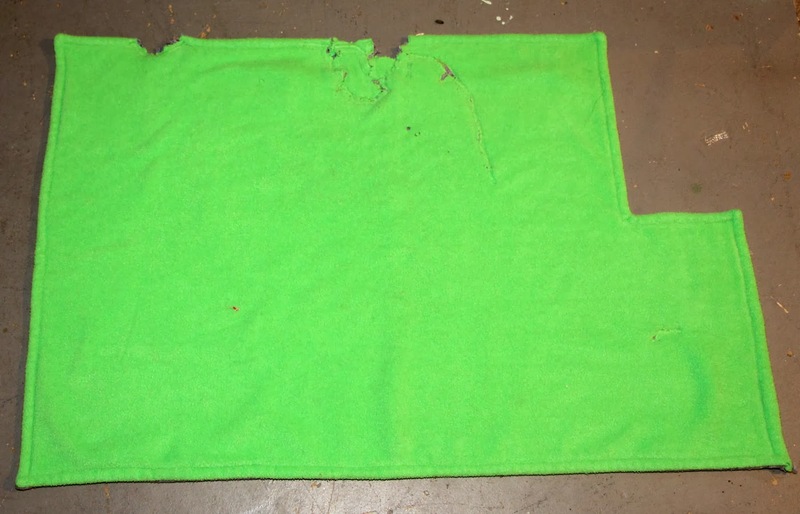 This chewing was significantly different than the normal chewing as it tore the fleece further in towards the center of the liner, and the damage was not restricted to the edges. They were trying to pull the fleece into their tree trunk hide and ending up chewing the fleece along one edge of the hide so they could then gather it inside. Fortunately, they did not chew through the furniture pad, just the fleece, so I could easily reattach the fleece to the furniture pad using a zig-zag stitch. 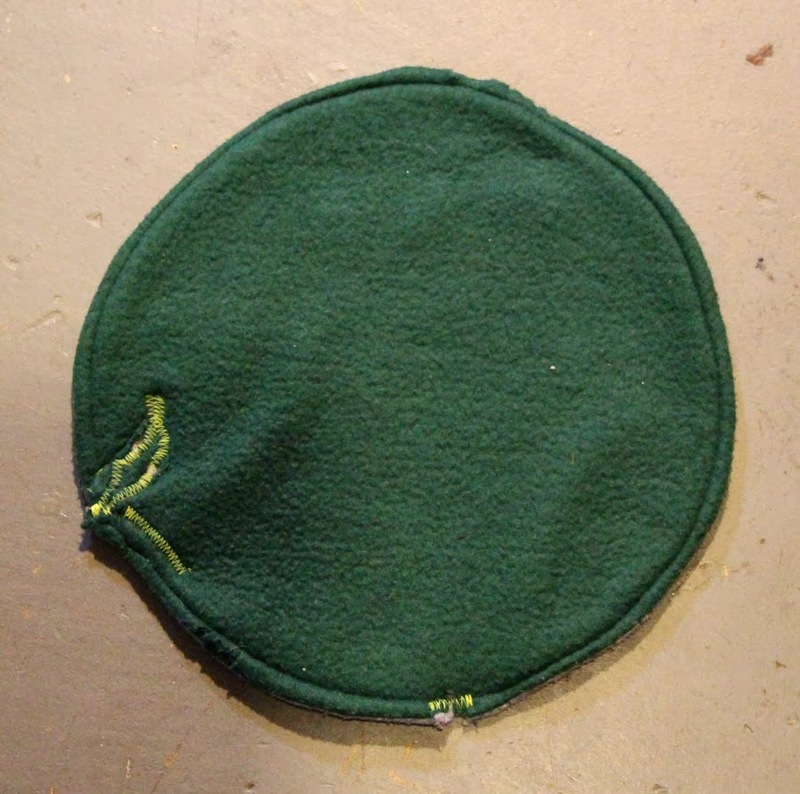 To try to discourage this type of chewing in the future, I have created a small circular liner pad that I use under the tree trunk hide. This allows them to pull this pad inside and chew it instead of the liner. So far, that has worked well, as I have not had any similar liner damage - just small damage to the circular pads, as shown. The two liners shown here are the worst of the damage done so far, and I consider them to have been repairable. Most liners survive with just small nibbles along the edges - many of which do not require repair, although I do like to stitch them up to try to discourage further damage in the same places. 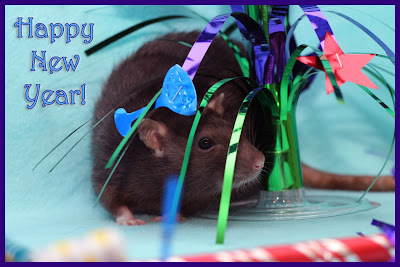 It is the start of a New Year and you might be thinking about what you can do to help animals in need this year. Sometimes, we put aside money to donate to good causes, and causes that help animals are close to my heart. During the holidays, we see advertisements on television that tug at our heartstrings. We are bombarded with pictures of abused and neglected animals that need medical attention and quality care and a loving home. This is a sad reality. And then we are hit with appeals to send our money to organizations such as the Humane Society of the United States (HSUS). Unfortunately, HSUS, and many other large national organizations do very little to help the animals in the situations they depict. By now, most informed people know what PeTA (People for the Ethical Treatment of Animals) is about. Their leaders have publically declared that they don't believe that any animals should be kept as pets and that they believe in a world where humans and animals have no interaction whatsoever. They euthanize the vast majority of the animals that they do take in, and they do so willingly, believing that animals are better off dead than as pets. What people often do not know is that over time, people with these types of beliefs have infiltrated other organizations - organizations that used to be legitimate animal welfare organizations. They have gotten their people on the Board of Directors of these organizations and eventually into leadership positions, turning these organizations from animal welfare organizations to animal rights organizations. This is what has happened to HSUS. Most of their funds are spent on lobbyists and lawyers, and very little money actually goes to any shelters. Ask your local shelter if they receive any money or assistance from HSUS. They will probably laugh. You might think that having more laws "protecting" animals is a good thing, but the truth is that, in most cases, there are already laws protecting the animals - there is just not enough manpower to enforce them. Making laws that are stricter and harder to comply with doesn't help most of the animals, it just makes it harder for good honest people to keep their animals legally. Animal cruelty continues because people choose to break the law and don't fear getting caught. Adding more laws won't stop them. And this is the intention of the animal rights groups - to make it harder and harder to own/breed/rescue animals legally. Sometimes the laws sound good on paper, but in practice, become overwhelming. For example, it might sound good to require a license for anyone to sell, trade, or give away an animal that was born in their home. However, what do you do if you purchased a pregnant rat and it gives birth and you need to rehome the babies, but you don't have a license? And situations often change once the law is created. The law can't change without going through the proper process, but the requirements for getting a license can often change without changing the law. So a license that might have once just required registration, may be changed later without any process, to require inspections and standards that one's personal home could never live up to. Often, laws don't specify the animals they apply to, and what is a good law for a dog might be a terrible law for a rat. For example, in Illinois, there is a law that a foster home can only keep a max of 4 animals at once. I am not sure if the law specifies a species, but if it does not, that makes it difficult to foster flock animals like a group of finches, and can make it hard to foster a litter of rats. There are a lot of ways a law can look good on the surface but ultimately have the effect of deterring pet ownership. I am not writing this to get on a soap box and try to change your views. Those who support animal rights don't bother me. They believe in a cause and they fight for it and I believe in their right to do so. If you share those beliefs, I have no problem with you continuing to fight for them. I don't want to try to change your views any more than I want you to try to change mine. And you should continue to support organization like PeTA and HSUS who stand for your causes. What I would like to do is make people aware of the agenda of organizations like HSUS. So many people donate in response to the ads they see on TV and think they are supporting one thing when in reality, they are often supporting an organization that is quietly fighting against their rights as animal owners. If what you want is to help the animals in need, donate directly to your local shelters and rescues who actually work hands on, every day, with those animals. You will do way more good for an animal in need if you go directly to the source. Another thing to keep aware of is the use of "political correctness" when it comes to changing peoples perceptions on what is right and wrong. Animal rights groups try to introduce language into our vocabulary that ultimately intends to steer people toward their cause. For example, they try to get people to use the term guardian rather than owner. It sounds nice. 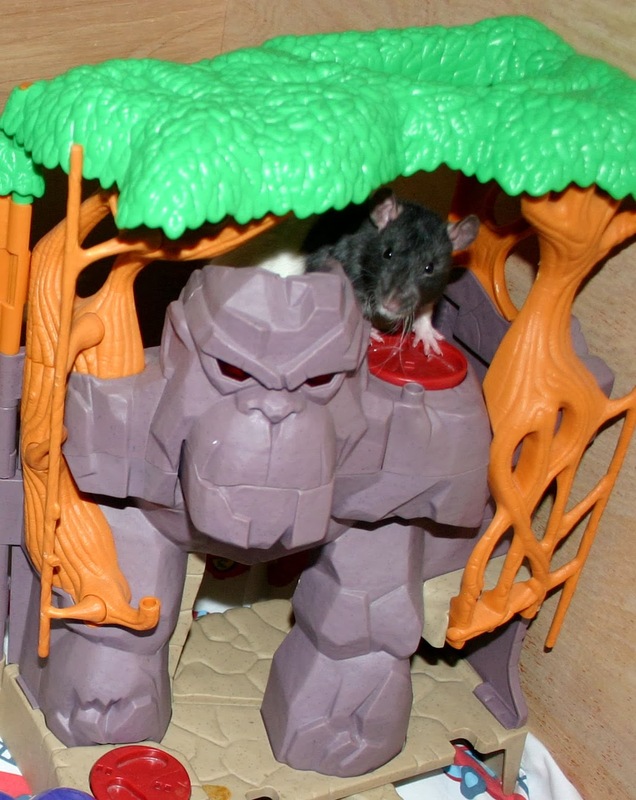 I am the guardian of my rats and my dogs and my birds. I guard them. I protect them. They have their own rights and I am just looking after them. But I believe in animal ownership. There are good owners and there are bad owners, but ownership in general is not a bad thing. An owner also guards and protects, but an owner has something that a guardian doesn't have - ownership rights. That is not the right to hurt, abuse, or neglect an animal you own - these things are already illegal. Ownership grants me the legal right to continue to guard and protect my animals as long as I am not breaking any laws and am capable of continuing to do so. No one can take those animals away from me as long as I am keeping them legally in appropriate conditions. That right is important for the wellbeing of our animals. There are many cases where animals have been confiscated wrongly from their owners and euthanized before the owner could take action to get them back and defend themselves in court. Those rights are essential for protecting our ability to continue to keep pets in the future. So, if you want to help animals that are homeless or ill and in need of medical attention and you don't want to jeopardize your right to own animals in the future, be sure to donate to your local shelters and rescues. I like to support rescues with 501-C3 status, as they must meet stringent guidelines to qualify. However, many private individuals do a lot of good work rescuing unwanted animals as well - but I would make sure I knew the people running the operation and was familiar with the work they do before I donate. At the end of the year, if I have a nice cushion in my personal budget, I will splurge and buy myself some luxury that I don't really need, but that I've always wanted to have. This year, that purchase was a grommet press. 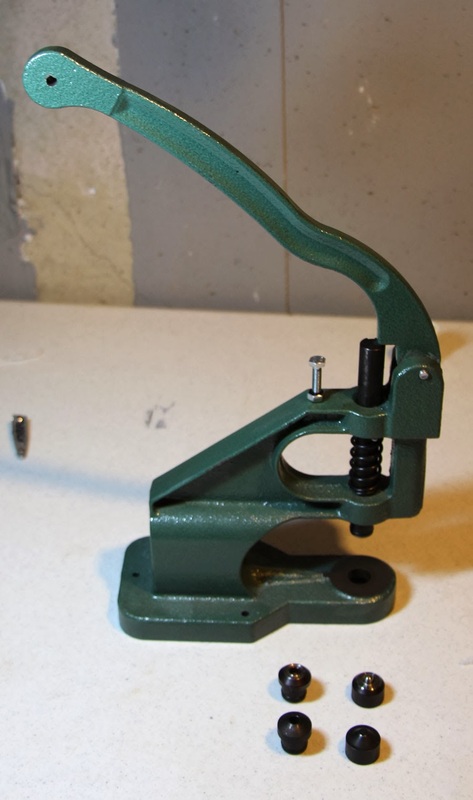 The press that I purchased was the Standard Grommet Tool available from www.grommetworld.com. The box indicated that it is made by Rowley. In addition to the press, I also had to purchase one set of cutting dies and one set of setting dies (I purchased dies for the #0 sized grommets, which are the equivalent of 1/4" grommets). 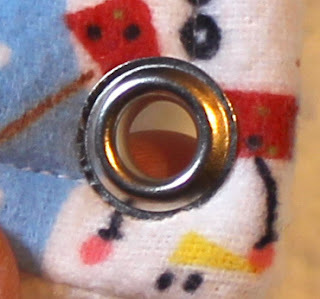 The cutting dies are used to cut the hole in the fabric and the setting dies are used to press the grommet into place. The grommet press runs about $90 and the dies run about $26 per set. This is a pretty hefty investment, so for casual hammock makers, you are probably better off using Dritz grommet/eyelet pliers (a tutorial for using the pliers can be found in our Tutorials for Common Rat Hammocks and Accessories PDF) or the mallet method. The grommet press does present some advantages over the other methods, however. 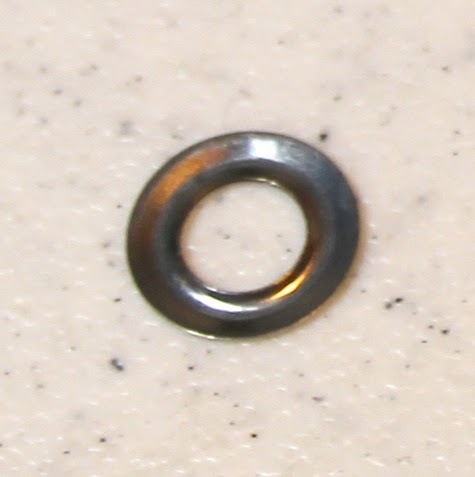 First, grommets purchased from a site like Grommetworld are much cheaper than Dritz grommets/eyelets purchased from JoAnns, and these grommets cannot be used with the Dritz pliers. A package of 15 from JoAnn's runs about $3.75, which comes to about 25 cents per eyelet/grommet. 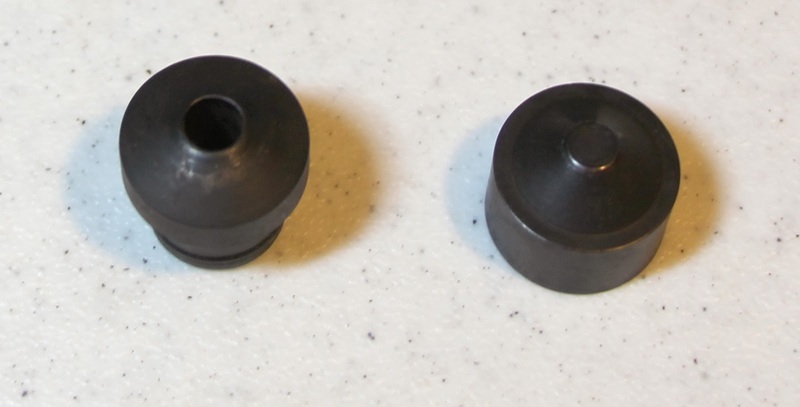 But I have found the packages to be inconsistent, often giving you more washer pieces than grommet pieces, with a total less than the promised 15. Grommets from Grommetworld come in packages of 144 for $7.74 (a little more for black), which is about 5 cents per grommet. Thus, if you make many hammocks over time, that price difference begins to add up quickly. Second, the grommets from Grommetworld are much stronger and more durable than the grommets from Dritz. You can feel the difference in the weight of the grommets. Third, a press will set the grommets properly every time. With the pliers, I would occasionally misalign the grommet, resulting in a bent, misshapen, or ruined grommet. The press does not have this problem. If I didn't press the grommet closed tightly enough, I can repeat the press and tighten it without damaging the grommet. There are a few drawbacks to using a press, however. Obviously, the upfront investment is one. Second, you will need a strong table or workspace to operate the press. It is best if you can screw the press to the table for support, but I cannot do this. The press is heavy and unwieldy and not very portable, so you probably will only be setting grommets in your work area and not in front of your TV or at a friend's house. There is a learning curve that goes along with learning to use it and I had trouble getting the cutting dies to work initially. However, for professional quality grommets, you can't beat a press. When using the press, you first have to install the cutting dies. The cutting dies will cut the holes in your fabric. The piece with the hole in the center (leftmost die in picture) is installed at the bottom of the press. The piece with the solid point (rightmost die) is installed at the top. You can then position your fabric between the two ends and push the handle down hard to cut a hole just like a hole punch. I have found that once I got everything set up, the press could put a hole through four layers of fabric (2 layers of cotton and 2 layers of fleece) effectively. It does take a little elbow grease, and occasionally, I have to redo it to get through all layers. Once you have your hole cut (I usually cut all the holes for a set of hammocks all at one time), you need to switch to the setting dies to set the grommet. The piece with the washer-shaped hole (leftmost die in the picture) is installed at the bottom of the press. The piece with the point in the center (rightmost die) is installed at the top. (Note: to remove the bottom die, I have found that it is sometimes easier to tip the press over and push it out from the hole in the bottom of the press). 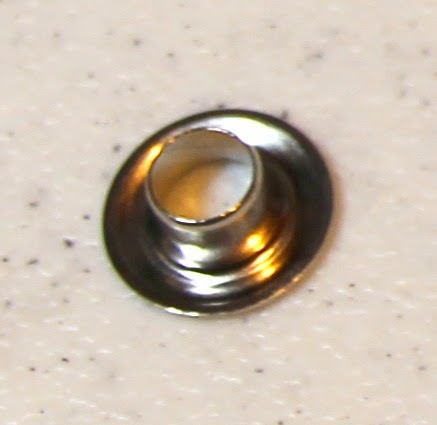 To set the grommet, you position the grommet piece on the bottom with the shaft sticking up. 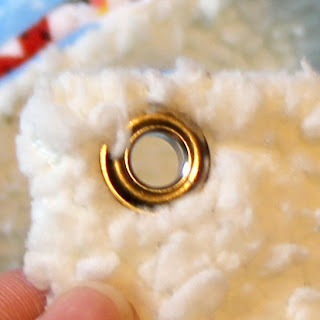 Put the fabric on top, sticking the shaft of the grommet through the hole that you punched. Put the washer on top (I do it so that the washer is curved down - but I am not sure if this is the recommended way or not). The entire thing should be set on top of the setting die (the grommet should fit comfortably on top of the lower setting die), and then push down firmly on the handle. The grommet should be nice and tight (push harder if it is loose). These pictures do not do the grommets justice - for whatever reason, the lighting was bad and these come out looking rough. The real things are much more polished than they appear in the photo. Because some things are easier ﻿seen in video, I created the following demonstration of setting grommets in a hammock using this press. I will never be a YouTube star, so forgive my clumsy performance. I tried to stay out of the way of the camera - but it was difficult to operate the press and position myself so that I wasn't blocking the view, so it was a bit awkward. However, you should get the general idea of how the press operates and whether or not it might be for you.